The waterfall Dettifoss is located in Iceland. Known as a country of geysers, Dettifoss can boast that it is the most powerful waterfall, which can be seen throughout Europe. The Icelanders rightly call Dettifoss their local, Niagara. There are few words to describe the spectacular picture and sound of the powerful falling water of Dettifoss. Particularly impressive is the view during the warm months of the year when the melting ice enhances the water jet resulting in the formation of the shock absorbing noise. Jokulsargljufur is the widest and picturesque canyon in Iceland. It is approximately 25 km long, half a kilometer wide and in places reaches depths up to 100 meters. Jokulsargljufur is formed by the turbulent waters of the river Jokulsa which originated from the northern parts of the glacier, Vatnajökull. The local river has several waterfalls - Selfoсs, 10 meters high, Hafragilsfoss, whose water falls from 27 meters, Retarfos, seven meters high and at the end, Dettifoss who holds the league's most powerful waterfall in Europe. The height of the waterfall Dettifoss is 45 meters. The water flow fell from a platform, reaching a width of 100 meters. There, the Dettifoss every second pours 200 cubic meters of water, which increases during spring because of the melting ice blocks. 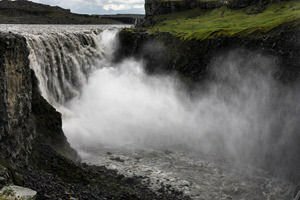 To get an idea of the enormous power of water that flows, Dettifoss having a water flow of 200 cubic meters per second can fill a huge ballroom in seconds. The closest town to Dettifoss is Myvatn, but the waterfall can only be reached by road. On the east side of Dettifoss there has been built a special parking for visitors. From the parking lot to the platform which underrun the monitoring of Dettifoss it is only about 10 minutes walking. The trail is quite steep, so you need to be careful. When you reach the platform you will find yourself just a few meters from the powerful falling waters, which are broken down in the water bath to form a beautiful white foam. Be careful when you're close to the waterfall, because the level of erosion is very high. There is a marked trail that leads to the waterfall Selfoss, which is also worth visiting. Waterfall Dettifoss, waterfall Selfoss and Hafragilsfoss turn on the eastern side of the river Jokulsa and were declared a national monument in 1996.